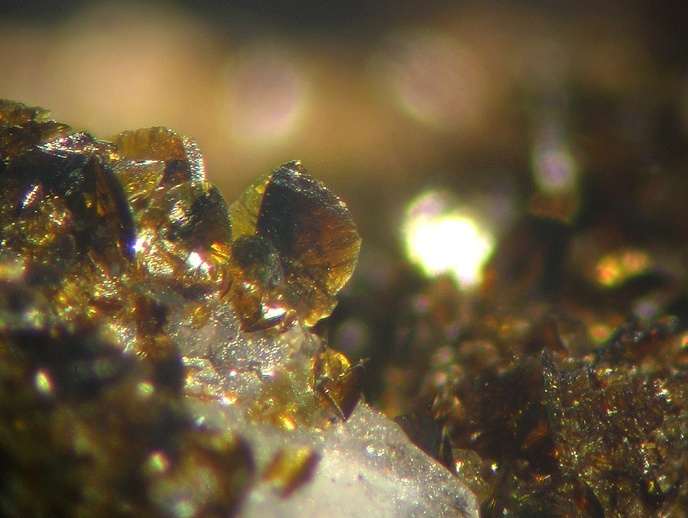 Vauquelinite: Mineral information, data and localities. 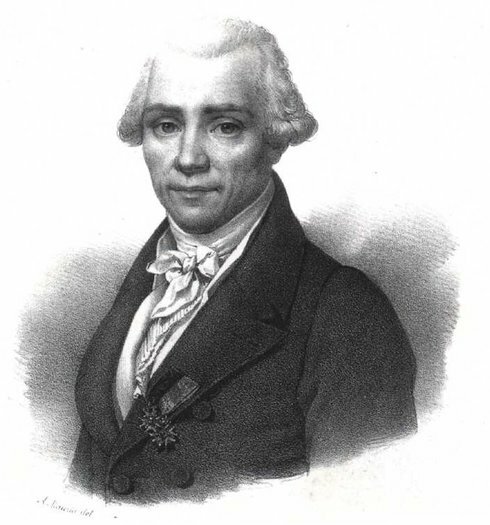 Named after Louis Nicolas Vauquelin (1763-1829), Professor of Chemistry, University of Paris (France) and discoverer of chromium. 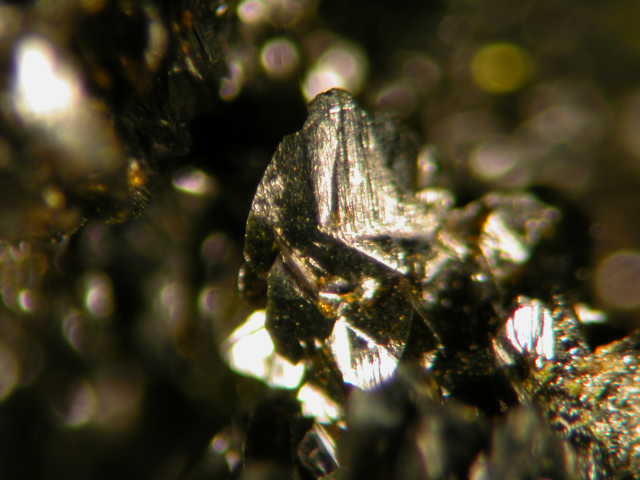 Fornacite-Vauquelinite Series. The phosphate analogue of fornacite. Related to the Brackebuschite Group. Crystals commonly minute and frequently wedge-shaped; irregularly aggregated; and mammillary fibrous forms; reniform; botryoidal; granular, compact. Crocoite 85 photos of Vauquelinite associated with Crocoite on mindat.org. Pyromorphite 17 photos of Vauquelinite associated with Pyromorphite on mindat.org. Embreyite 7 photos of Vauquelinite associated with Embreyite on mindat.org. Mimetite 7 photos of Vauquelinite associated with Mimetite on mindat.org. Phoenicochroite 7 photos of Vauquelinite associated with Phoenicochroite on mindat.org. Quartz 6 photos of Vauquelinite associated with Quartz on mindat.org. Hemihedrite 6 photos of Vauquelinite associated with Hemihedrite on mindat.org. Coronadite 5 photos of Vauquelinite associated with Coronadite on mindat.org. Goethite 4 photos of Vauquelinite associated with Goethite on mindat.org. Manganese Oxides 4 photos of Vauquelinite associated with Manganese Oxides on mindat.org. 22.5.3 Cassedanneite Pb5(CrO4)2(VO4)2 · H2O Mon. 22.5.13 Olmsteadite KFe2+2(Nb5+,Ta5+)(PO4)2O2 · 2H2O Orth. 22.5.14 Johnwalkite K(Mn2+,Fe2+,Fe3+)2(Nb5+,Ta5+)(PO4)2O2 · 2(H2O,OH) Orth. 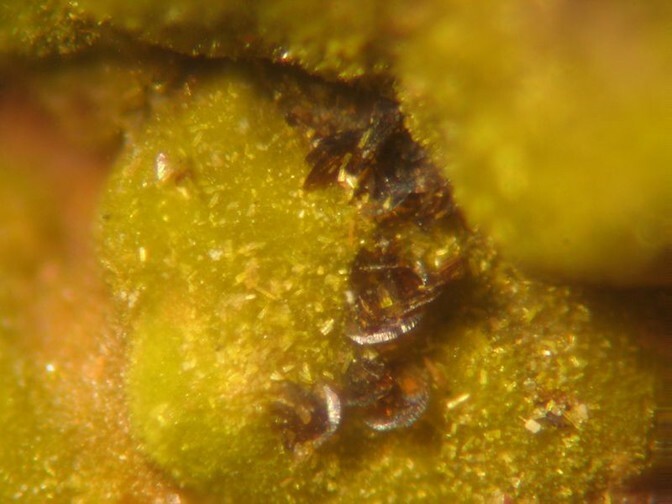 Reported as an alteration product of pyromorphite and as incrustation pseudomorphs after dolomite. Contains lead and chromium. Do not inhale dust and wash hands after handling. Berzelius (1818) Afhandlingar I Fysik, Kemi och Mineralogi, Stockholm: 6: 246 (as Vauqueline). Berzelius, J.J. (1819) Nouveau système de Minèralogie. Translated from the Swedish. 8vo, Paris: 202. Haüy, R.J. (1822) Traité de minéralogie. second edition, 4 volumes, with fol. Atlas: 3: 363 (as Plomb chromé). Haidinger (1827) Edinburgh Journal of Science: 7: 213. Phillips, Wm., augmented by Allan, R. (1837) Mineralogy, Fourth edition London: 369 (as Chromate of Lead and Copper). John (1845) Neues Jahrbuch für Mineralogie, Geologie und Paleontologie, Heidelberg, Stuttgart: 67 (as Chromphosphokupferbleispath). Blum, J.R. (1863) Die Pseudomorphosen des Mineralreichs. Stuttgart, nachträge 3, Erlangen: 197. Nordenskiöld (1867) Ak. Stockholm, Őfv. : 24: 655 (as Laxmannite). Nordenskiöld (1869) Annalen der Physik, Halle, Leipzig: 137: 299 (as Laxmannite). Hermann (1870) Journal für praktische Chemie, Leipzig: 1: 196, 447 (as Phosphorchromit). Davies (1877) Mineralogical Magazine: 1: 112. Koksharov, N. von (1878) Materialien zur Mineralogie Russlands. 11 volumes with atlas: vol. 8: 345. Pisani (1880) Bulletin de la Société française de Minéralogie: 3: 196. Des Cloizeaux (1882) Bulletin de la Société française de Minéralogie: 5: 53. Dana, E.S. (1892) System of Mineralogy, 6th. Edition, New York: 916. Lacroix, A. (1910) Minéralogie de la France et des ses colonies, Paris. 5 volumes: vol. 4: 448. Petterd, W.F. (1910) Catalogue of the Minerals of Tasmania. 221pp., Hobart: 196. Larsen, E.S. (1921) The Microscopic Determination of the Nonopaque Minerals, First edition, USGS Bulletin 679: 153. Goldschmidt, V. (1923) Atlas der Krystallformen. 9 volumes, atlas, and text, Heidelberg: vol. 9: 54. Chirva (1935) Annals Leningrad State University, Series Geology: 1: 19 [Min. Abs. : 7: 460]. Palache, C., Berman, H., & Frondel, C. (1951), The System of Mineralogy of James Dwight Dana and Edward Salisbury Dana, Yale University 1837-1892, Volume II. John Wiley and Sons, Inc., New York, 7th edition, revised and enlarged, 1124 pp. : 650-652. Zeitschrift für Kristallographie (1968): 126: 433. Bulletin de la Société française de Minéralogie et de Cristallographie (1980): 103: 469. The following Vauquelinite specimens are currently listed for sale on minfind.com. Eberhard Reich info taken from old specimen label. Piret, P., Deliens, M., & Piret-Meunier, J. (1985). Occurrence and crystal structure of kipushite, a new copper-zinc phosphate from Kipushi, Zaire. Canadian Mineralogist, 23, 35-42. Palache, C., Berman, H., & Frondel, C. (1951), The System of Mineralogy of James Dwight Dana and Edward Salisbury Dana, Yale University 1837-1892, Volume II: 651. Lapis, 12 (10), 23-32+ 58. Sehrig, M. (2012): Krokoit aus dem Ural - nicht nur aus Beresovka. Lapis, 37 (12), 30-31 (in German). Reeks, G. (2007) Olifantspoort Mine, Olifantspoort, Northern Province. South African Micromount Society newsletter: 33(3); Wight, Q. (2002). Through the'Scope: The Year in Micromounting: 2001 Was a Year of Change. Rocks & Minerals, 77(3), 181-189. Davies, T. (1877) VI. — Notes on vauquelinite from Scotland, and cantonite from Cornwall. Mineralogical Magazine, vol. 1, n° 4, 112-114.; Bannister, F.A. (1933) The identity of mottramite and psittacinite with cupriferous descloizite. Mineralogical Magazine, vol. 23, n° 141, 376-386.; Kingsbury, A.W.G. and Hartley, J. (1956) New occurrences of vanadium minerals (mottramite, descloizite, and vanadinite) in the Caldbeck area of Cumberland. Mineralogical Magazine, vol. 31, n° 235, 289-295. Davies, T. (1877) VI.— Notes on vauquelinite from Scotland, and cantonite from Cornwall. Mineralogical Magazine vol. 1, n° 4, 112-114.; Bannister, F.A. (1933) The identity of mottramite and psittacinite with cupriferous descloizite. Mineralogical Magazine, vol. 23, n° 141, 376-386.; Kingsbury, A.W.G. and Hartley, J. (1956) New occurrences of vanadium minerals (mottramite, descloizite, and vanadinite) in the Caldbeck area of Cumberland. Mineralogical Magazine, vol. 31, n° 235, 289-295 (referring to Davies (1877) and Bannister (1933)). Anthony, J.W., et al (1995), Mineralogy of Arizona, 3rd. ed. : 325, 343, 412. Anthony, J.W., et al (1995), Mineralogy of Arizona, 3rd.ed. : 413; Williams, S.A. (1968), Wickenburgite, a new mineral from Arizona, Am.Min. : 53: 1433-1438; Williams, S.A. & J.W. Anthony (1970), Hemihedrite, a new mineral from Arizona, Am.Min. : 55: 1088-1102; Williams, S.A., et al (1970), A study of Phoenichchroite-Its structure and properties, Am.Min. : 55: 784-792. Anthony, J.W., et al (1995), Mineralogy of Arizona, 3rd.ed. : 413; Allen, G.B. & W. Hunt (1988), The Tonopah-Belmont Mine, Maricopa Co., AZ, Min.Rec. : 19(3): 139-144. Anthony, J.W., et al (1995), Mineralogy of Arizona, 3rd.ed. : 412; Silliman (1881); Galbraith, F.W. & D.J. Brennan (1959), Minerals of AZ: 67. Anthony, J.W., et al (1995), Mineralogy of Arizona, 3rd.ed. : 412; Silliman, B. (1881), Mineralogical Notes, Amer. Jour. Sci. : 22: 198-205; Galbraith, F.W. & D.J. Brennan (1959), Minerals of AZ: 67. Anthony, J.W., et al (1995), Mineralogy of Arizona, 3rd.ed. : 412; Silliman, B. (1881), Mineralogical notes, Amer.Jour.Sci. : 22: 198-205; Galbraith, F.W. & D.J. Brennan (1959), Minerals of AZ: 67. Anthony, J.W., et al (1995), Mineralogy of Arizona, 3rd.ed. : 413; Williams, S.A. (1968), Wickenburgite, a new mineral from AZ, Am.Min. : 53: 1433-1438; Williams, S.A. & J.W. Anthony (1970), Hemihedrite, a new mineral from AZ, Am.Min. : 55: 1088-1102; Williams, S.A., et al (1970), A study of phoenicochroite-Its structure and properties, Am.Min. :: 55: 784-792. Anthony, J.W., et al (1995), Mineralogy of Arizona, 3rd.ed. : 193, 327, 410, 412; Galbraith, F.W. & D.J. Brennan (1959), Minerals of AZ: 67. Joe Marty specimens; EDS and XRD confirmed. Whitlock, H P (1903) List of New York Mineral localities. New York State Museum. ⓘ Pequea Silver Mine ? Dana, E.S. (1892) System of Mineralogy, 6th. Edition, New York: 916,1069; Palache, C., Berman, H., & Frondel, C. (1951), The System of Mineralogy of James Dwight Dana and Edward Salisbury Dana, Yale University 1837-1892, Volume II: 652; Rocks & Minerals: 20: 319. Lance E. Kearns and Michael D. Dunn (2008) Mineral News, 24, #8, 1-6.